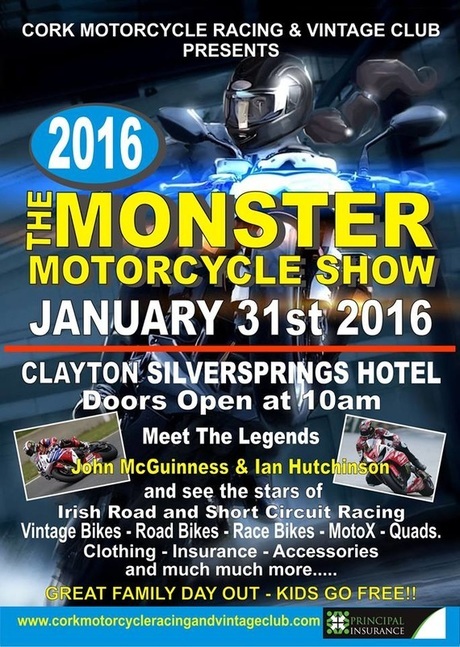 The Monster Motorcycle Show takes place in the Clayton Silver Springs hotel, Cork on Sunday 31st January 2016. Organised by the Cork Motorcycle Racing and Vintage Club (CMRVC), the show is a well established event on the national calendar featuring vintage and modern bikes as well as off road bikes and quads alongside clothing, accessories, training and more. Exhibitors include Lee Motorcycles and Waterford Harley Davidson. The show is traditionally a great family friendly event and kids go free. Doors open at 10am and this years show features road racing stars John McGuinness and Ian Hutchinson. What better way to see off the January blues? !